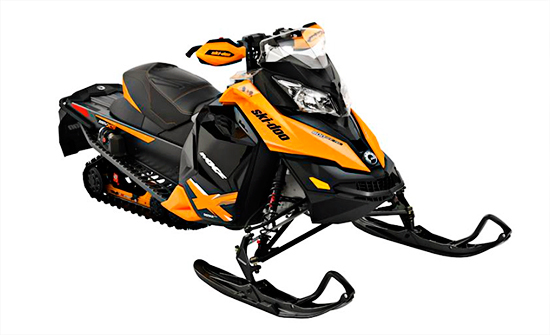 Ski-Doo announced new 2014 snowmobiles that feature chassis and suspension upgrades. The big news is a new four-stroke Rotax 900 Advanced Combustion Efficiency (ACE) engine that achieves 23 MPG. The inline 899cc triple is an outgrowth of the existing 600 ACE twin, with another cylinder added. The four valves per cylinder, dual overhead cam, fuel injection 900 pumps out 90 HP through a single 46mm throttle body. A new drive-by-wire Intelligent Throttle Control (ITC) has made the throttle cable obsolete. It is all controlled electronically. There are three modes: Sport Mode for quick throttle response, Standard mode for everyday riding, and Eco for maximum economy. Ski-Doo claims the 900 has 77 percent more torque and 50 percent more horsepower than the ACE 600. The ACE 900 engine is available in the MXZ TNT, Renegade Adrenaline, GSX-LE, Grand Touring LE, and the Expedition Sport. In the suspension department the rMotion skid has been expanded into the GSX and SE and LE Grand Touring line. In the past the suspension was only available in the aggressive mega-bump sled line. The left side control block on the handlebars on the REV-XS chassis get new vertical hand and thumb warmer switches with more settings and intuitive controls. They also benefit from a larger, more protected button for the starter and RER push-button reverse. The new Silent Drive featured on the Grand Touring LE 900 has a new sprocket, track and rail design to eliminate track noise. More details are available at Ski-Doo.